Human peripheral blood lymphocytes stained with Multi-Colour Human CD45RA/CD45RO/CD8/CD3 flow kit (4C005). 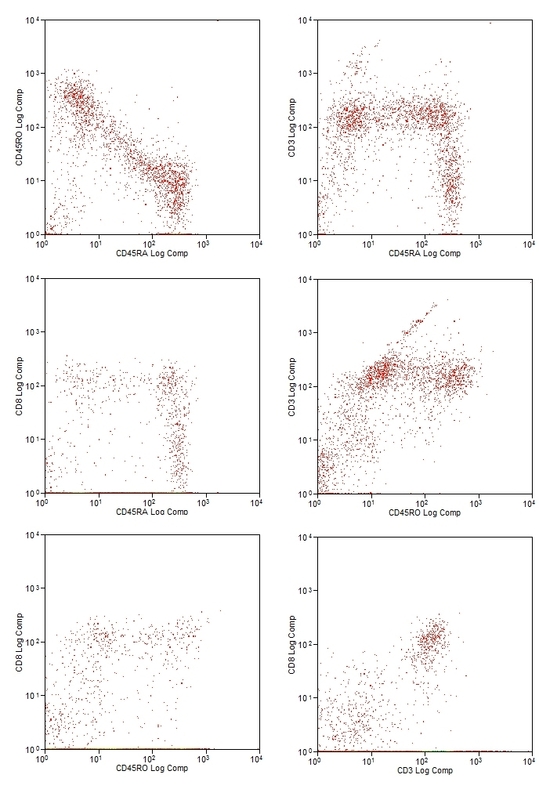 Four-Color Human CD45RA/CD45RO/CD8/CD3 Flow Kit can be used for single-step identification of human cytotoxic naïve (CD3+CD8+CD45RA+) and cytotoxic memory (CD3+CD8+CD45RO+) T-cell subsets. CD8 is a cell surface glycoprotein which acts as a co-receptor for MHC Class I, in conjunction with the T-cell receptor (TCR). CD8 exists as a dimer, composed of two α chains or more commonly as an αβ heterodimer. The CD8 antigen is expressed on the human cytotoxic T-cell subset (CD3+CD8+) and on a subset of NK cells. Binding of CD8 to MHC class I, acts to enhance resting T-cell activation. Clone LT8 is specific for the CD8α chain. Four color combination consisting of FITC, RPE, APC and RPE-Cy5.5 conjugated monoclonal antibodies mixed in optimal ratio - lyophilised.